Scientific Aviation conducts atmospheric measurements, emissions flux quantifications, and aerial leak detection and repair (LDAR) from instrumented airborne platforms. Unlike other airborne platforms that use imaging technology to perform non-quantitative identification of emissions sources, our detection and measurement methods utilize in situ chemical analyzers, which allow for real-time, unambiguous recognition and identification of leaks, lower limits of detection, and accurate emissions quantification while eliminating the need for extensive post-processing. Both our manned aircraft and drones are equipped standard with measurements of temperature, pressure, relative humidity, horizontal winds (Conley et al., 2014), and aircraft position, speed, and attitude. Our mobile laboratory is similarly equipped with temperature, pressure, relative humidity, location, and speed, and has a roof-mounted sonic anemometer for winds. Our Mooney aircraft have three integrated rearward-facing, under-wing air intake inlets on the right wing that connect to the rear luggage compartment of the cabin. The three inlets are approximately 5 m long, and are composed of different materials (stainless steel, Teflon, and Kynar) to allow for an inlet material that is compatible with the atmospheric species being measured. We conduct in situ atmospheric measurements for a variety of chemical species using flight-capable analytical instrumentation. Scientific Aviation owns instruments for measuring methane and ethane (Picarro and Aeris), CO and CO2 (Picarro), Ozone (2B Technologies), NO (EcoPhysics), and NO2 (Aerodyne and Teledyne), as well as the capability for collecting whole air flask samples for offline analysis of speciated volatile organic compounds (VOCs). We can also integrate any client-owned compound-specific analyzer that fits within the weight and power limitations of our aircrafts, drones, or mobile laboratory. All data from the aircraft/drone/mobile laboratory, meteorological sensors, and chemical analyzers are transmitted to an onboard computer where Scientific Aviation’s custom software compiles, stores, and displays the data in real time. All data is continuously uploaded and stored to our secure cloud-based data repository allowing for concurrent data monitoring and visualization from the ground. Our emissions quantification analyses are performed nearly autonomously using our own custom designed and programmed software, allowing for rapid turnaround time for our clients. Scientific Aviation has extensive experience in emissions quantifications from a variety of both point sources and large area sources, including upstream oil and gas facilities, refineries, power plants, landfills, agricultural feedlots and dairies, and even the Arctic tundra. Our quantification methods utilize onboard measurements of horizontal and/or vertical winds and in situ measurement of chemical species to calculate the flux rate. Our quantifications have been independently tested and validated on numerous occasions using both controlled-release verification and in side-by-side comparisons with alternative methods. Depending on the source, the location, and the application, we can use a quantification method that offers the best solution. Mass balance methods are, in essence, based upon the Law of Conservation of Mass. This approach hinges upon that principle that, for a conserved tracer, if one measures the mass of a species entering the system and the mass of that species exiting the system, then the mass originating from within the system (i.e., an emissions source) can be determined as the difference (the balance) of the two measurements. With the additional knowledge of flow rate (i.e., wind speed), a flux can be calculated as a horizontal mass flow across a vertical plane (White et al., 1976). In the atmosphere, this approach is often used for long-lived trace gas species, such as methane or CO2. 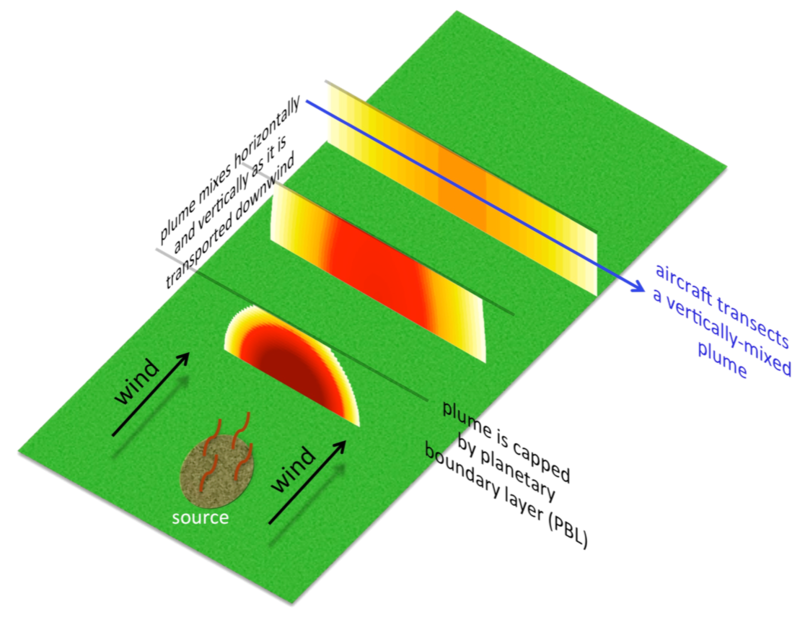 Numerous studies have demonstrated the utility of using an aircraft platform for performing mass balance measurements to determine emissions from large area sources, such as landfills, oil and gas fields, and even entire cities (e.g., Mays et al., 2009; Karion et al., 2013; Caulton et al., 2014; Cambaliza et al., 2015; Peischl et al., 2015; Peischl et al., 2016). For aircraft-based mass balance measurements, transects are typically flown perpendicular to the wind direction both upwind (to obtain the background) and downwind of the source of interest. These transects may consist of multiple stacked legs (i.e., a curtain pattern) or a single altitude transect within the boundary layer that is sufficiently downwind of a source such that the trace gas species is fully mixed within the boundary layer. In other situations, such as when there are no significant upwind sources of species or nearby rising terrain presents physical limitations, transects may only be flown on the downwind side. In this case, the “background” concentration of the gas can be assumed from the edges of the transect that are outside of the source plume. The traditional mass balance approach is typically best suited for large area sources, such as an entire oil and gas production field, for example, or a large source that is isolated/remote from other sources. The development of the Gauss’s Theorem method grew out of the need to identify and quantify emissions from individual point sources, such as individual well pads within an extensive oil and gas production field. This approach relies on flying consecutive loops around a targeted source at multiple altitudes to create a virtual cylinder that encompasses the lowest safe flight level ( ~200 ft agl) and extends up to an altitude just above the vertical extent of the measured plume. In this fashion, the plume is fully contained with the cylinder, and the volume flux of a gas out of the cylinder (downwind from the source) can be determined and corrected for the flux of that gas entering into the cylinder (upwind from the source). Gauss’s Law is used to convert the volume integral to a surface integral to calculate the horizontal mass flow of gas across the surface plane of the cylinder (Conley et al., 2017). In practice, a full “research-grade” quantification of a point source requires ~15-20 laps (approximately 30 minutes flight time). The uncertainty of the resulting emissions estimate reduces as the number of laps are increased. Under optimal conditions, demonstrated uncertainties are quite low, often better than 10%, and limits of detection are 5 – 10 kg/hr. For applications for which high measurement accuracy is not required (e.g., do we have a small leak or a large leak? ), quick-look estimates can be achieved in as little as 5 – 10 minutes to provide an order-of-magnitude level emission rate. This approach can greatly increase time-efficiency and cost-efficiency when assessing numerous sites. The diameter of the loops (i.e., the measurement footprint) flown by the airplane is typically 1 – 2 km. Thus, in areas with more densely-located sourced, the measurement footprint may potentially contain more than one individual point source. In this case, the resulting emissions estimate will represent the total emissions from all sources located within the footprint. For smaller sources and for where near-field quantification and pin-point location accuracy are desired, our unmanned drone platforms are the ideal solution. Our drones operate on the same principles as our aircraft, including the capability for measuring horizontal winds, and offer a much lower limit of detection (~10 g/hr). The ability to fly nearer to sources, combined with the winds and methane measurement, allows us to locate the source of a leak to within ~ 1 meter. The eddy covariance (EC) technique for calculating fluxes to/from a surface has been used for several decades from ground-based tower platforms, aircraft, and ships. EC is the most direct method for measuring vertical fluxes and is based upon the principle that chemical species are transported vertically (upward or downward) via turbulent eddies. Thus, the correlation (covariance) between fast fluctuations (typically 1 – 10 Hz) in vertical turbulence and the concentration of a gas tracer are used to determine the direction and magnitude of a flux: upward moving eddies correlated with positive enhancements in gas tracer concentration are indicative of surface emissions, whereas surface depositions are characterized by anticorrelations. The EC technique is most appropriate for area sources that are homogeneous and a terrain that is flat over extended distances (e.g., ocean surface, tundra, agricultural fields). Brandt, A. R., Heath, G. A., and Cooley, D.: Methane leaks from natural gas systems follow extreme distributions, Environ. Sci. Technol., 50, 12512 – 12520, 2016. Cambaliza, M.O.L., Shepson, P.B., Bogner, J., Caulton, D.R., Stirm, B., Sweeney, C., Montzka, S.A., Gurney, K.R., Spokas, K., Salmon, O.E., Lavoie, T.N., Hendricks, A., Mays, K., Turnbull, J., Miller, B.R., Lauvaux, T., Davis, K., Karion, A., Moser, B., Miller, C., Obermeyer, C., Whetstone, J., Prasad, K., Miles, N. and Richardson, S.: Quantification and source apportionment of the methane emission flux from the city of Indianapolis, Elem Sci Anth, 3, p.000037, 2015. Caulton, D. R., Shepson, P. B., Santoro, R. L., Sparks, J. P., Howarth, R. W., Ingraffea, A. R., Cambaliza, M. O. L., Sweeney, C., Karion, A., Davis, K. J., Stirm, B. H., Montzka, S. A., and Miller, B. R.: Toward a better understanding and quantification of methane emissions from shale gas development, Proc. Natl. Acad. Sci., 2014. 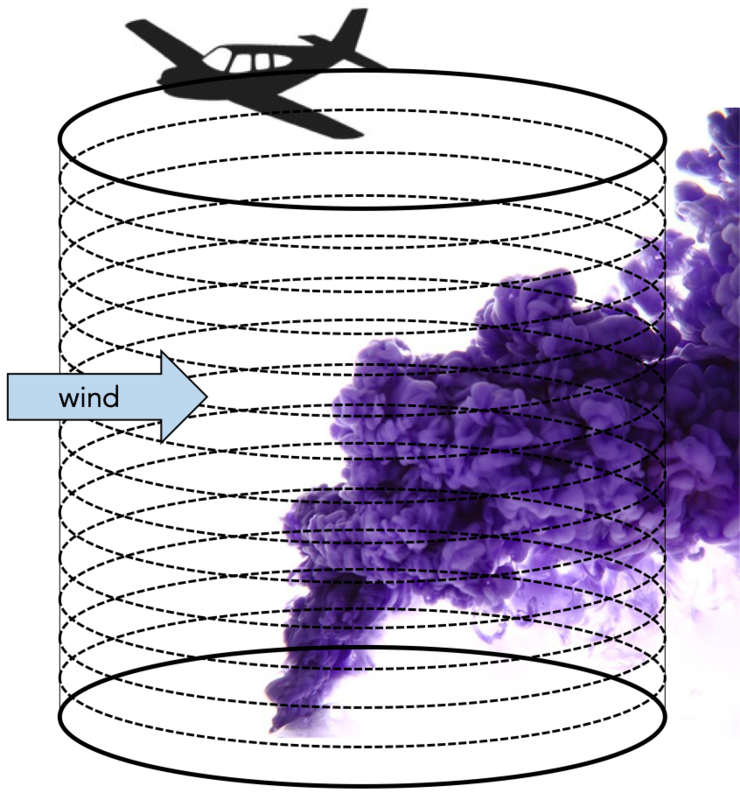 Conley, S. A., Faloona, I. C., Lenschow, D. H., Karion, A., and Sweeney, C.: A low-cost system for measuring horizontal winds from single-engine aircraft, J. Atmos. Ocean. Technol., 31, 1312 – 1320, 2014. Conley, S., Franco, G., Faloona, I., Blake, D. R., Peischl, J., Ryerson, T. B.: Methane emissions from the 2015 Aliso Canyon blowout in Los Angeles, CA, Science, 351, 1317 – 1320, 2016. Conley, S., Faloona, I., Mehrotra, S., Suard, M., Lenschow, D. H., Sweeney, C., Herndon, S., Schwietzke, S., Pétron, G., Pifer, J., Kort, E. A., and Schnell, R.: Application of Gauss’s theorem to quantify localized surface emissions from airborne measurements of wind and trace gases, Atmos. Meas. Tech., 10, 3345 – 3358, 2017. Johnson, M. R., Tyner, D. R., Conley, S., Schwietzke, S., and Zavala-Araiza, D.: Comparisons of airborne measurements and inventory estimates of methane emissions in the Alberta upstream oil and gas sector, Environ. Sci. Technol., 51, 13008 – 13017, 2017. Karion, A., Sweeney, C., Pétron, G., Frost, G., Hardesty, R. M., Kofler, J., Miller, B. R., Newberger, T., Wolter, S., Banta, R., Brewer, A., Dlugokencky, E., Lang, P., Monztka, S. A., Schnell, R., Tans, P., Trainer, M., Zamora, R., and Conley, S.: Methane emissions estimate from airborne measurements over a western United States natural gas field, Geophys. Res. Lett., 40, 4393 – 4397, 2013. Lyon, D. R., Zavala-Araiza, D., Alvarez, R. A., Harriss, R., Palacios, V., Lan, X., Talbot, R., Lavoie, T., Shepson, P., Yacovitch, T. I., Herndon, S. C., Marchese, A. J., Zimmerle, D., Robinson, A. L., and Hamburg, S. P.: Constructing a spatially resolved methane emission inventory for the Barnett Shale region, Environ. Sci. Technol., 49 (13), 8147 – 8157, 2015. Mays, K. L., Shepson, P. B., Stirm, B. H, Karion, A., Sweeney, C., and Gurney, K. R.: Aircraft-based measurements of the carbon footprint of Indianapolis, Environ. Sci. Technol., 43, 7816 – 7823, 2009. Peischl, J., Ryerson, T. B., Aikin, K. C., de Gouw, J. A., Gilman, J. B., Holloway, J. S., Lerner, B. M., Nadkarni, R., Neuman, J. A., Nowak, J. B., Trainer, M., Warneke, C., and Parrish, D. D.: Quantifying atmospheric methane emissions from the Haynesville, Fayetteville, and northeastern Marcellus shale gas production regions, J. Geophys. Res., 120, 2119 – 2139, 2015. Peischl, J., Karion, A., Sweeney, C., Kort, E. A., Smith, M. L., Brandt, A. R., Yeskoo, T., Aikin, K. C., Conley, S. A., Gvakharia, A., Trainer, M., Wolter, S., and Ryerson, T. B.: Quantifying atmospheric methane emissions from oil and gas production in the Bakken shale region of North Dakota, J. Geophys. Res., 121, 6101 – 6111, 2016. Pétron, G., Frost, G., Miller, B. R., Hirsch, A. I., Montzka, S. A., Karion, A., Trainer, M., Sweeney, C., Andrews, A. E., Miller, L., Kofler, J., Bar-Ilan, A., Dlugokencky, E. J., Patrick, L., Moore Jr., C. T., Ryerson, T. B., Siso, C., Kolodzey, W., Lang, P. M., Conway, T., Novelli, P., Masarie, K., Hall, B., Guenther, D., Kitzis, D., Miller, J., Welsh, D., Wolfe, D., Neff, W., and Tans, P.: Hydrocarbon emissions characterization in the Colorado Front Range: a pilot stuy, J. Geophys. Res., 117, 2012. Schwietzke, S., Harrison, M., Lauderdale, T., Branson, K., Conley, S., George, F. C., Jordon, D., Jersey, G. R., Zhang, C., Mairs, H. L., Pétron, G., and Schnell, R. C.: Aerially-guided leak detection and repair: a pilot field study for evaluating the potential of methane emission detection and cost-effectiveness, J. Air Waste Manag. Assoc., 69, 71 – 88, 2019. Smith, M. L., Kort, E. A., Karion, A., Sweeney, C., Herndon, S. C., and Yacovitch, T. I.: Airborne ethane observations in the Barnett Shale: quantification of ethane flux and attribution of methane emissions, Environ. Sci. Technol., 49, 8158 – 8166, 2015. Smith, M. L., Gvakharia, A., Kort, E. A., Sweeney, C., Conley, S. A., Faloona, I., Newberger, T., Schnell, R., Schwietzke, S., and Wolter, S.: Airborne quantification of methane emissions over the Four Corners Region, Environ. Sci. Technol., 51, 5832 – 5837, 2017. White, W.H., Anderson, J. A., Blumenthal, D. L., Husar, R. B., Gillani, N. V., Husar, J. D., Wilson Jr., W. E.: Formation and transport of secondary air pollutants: ozone and aerosols in the St. Louis urban plume, Science, 194, 187 – 189, 1976. Zavala-Araiza, D., Lyon, D., Alvarez, R. A., Palacios, V., Harriss, R., Lan, X., Talbot, R., and Hamburg, S. P.: Toward a functional definition of methane super-emitters: application to natural gas production sites, Environ. Sci. Technol., 49, 8167 – 8174, 2015.